You may think you don't know anyone who has been sexually abused, especially if most of your friends and acquaintances are Christians. But the statistics indicate otherwise. The Wounded Heart is an intensely personal and specific look at this most "soul deadening" form of abuse. Personal because it may be affecting you, your spouse, a close friend or neighbor, or someone you know well at church; and specific because it goes well beyond the general issues and solutions discussed in other books. 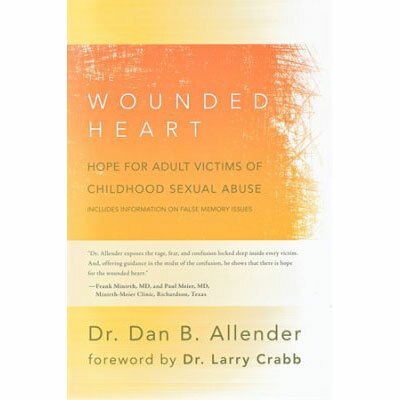 Dr. Allender's book reaches deep into the wounded heart of someone you know, exploring the secret lament of the soul damaged by sexual abuse and laying hold of the hope buried there by the One whose unstained image we all bear. Dr. Dan Allender received his M.Div. from Westminster Theological Seminary and his Ph.D. in counseling psychology from Michigan State University. Dan taught in the biblical counseling department of Grace Theological Seminary for seven years (1983-1989). From 1989-1997 he worked as a professor in the Master of Arts in biblical counseling program at Colorado Christian University, Denver, Colorado. Currently, Dan serves as president and professor of counseling at Mars Hill Graduate School in Bothell, Washington. He travels and speaks extensively to present his unique perspective on sexual abuse recovery, love and forgiveness, worship, and other related topics. He is the author of a number of published works including The Wounded Heart. He and his wife, Rebecca, live in the Puget Sound area with their three children, Annie, Amanda, and Andrew.